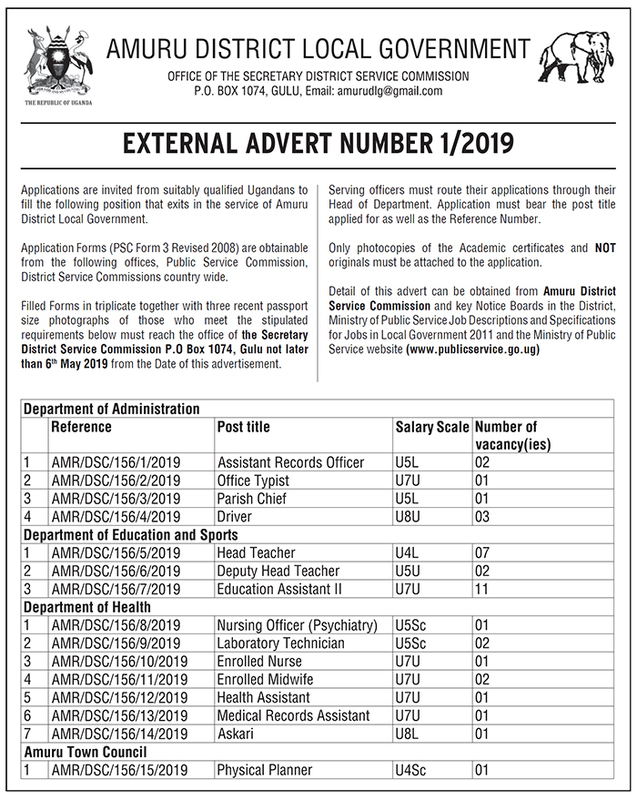 Applications are invited from suitably qualified Ugandans to fill the following position that exits in the service of Amuru District Local Government. Application Forms (PSC Form 3 Revised 2008) are obtainable from the following offices, Public Service Commission, District Service Commissions country wide. Filled Forms in triplicate together with three recent passport size photographs of those who meet the stipulated requirements below must reach the office of the Secretary District Service Commission P.O Box 1074, Gulu not later than 6th May 2019 from the Date of this advertisement. Serving officers must route their applications through their Head of Department. Application must bear the post title applied for as well as the Reference Number. Only photocopies of the Academic certificates and NOT originals must be attached to the application.